As the top crypto assets hint to go down, one cryptocurrency is beginning the week with a bang.Enjin Coin (ENJ) on Monday traded at $0.211, up 25% from the market open. Earlier today, during the Asian morning session, the crypto asset was trading at as low as $0.165. The price rally appeared majorly in the wake of a surprising volume surge in the South Korean markets. The move led ENJ-to-dollar rate above its new yearly high towards 0.227. ENJ Price Rally | Source: CMCBased on 24-hour live data, investors changed hands from/to Enjin Coin to the extent of $102.34 million, with 767,007,985 ENJ in circulation. Data on South Korean cryptocurrency exchanges Upbit and Bithumb showed South Korean Won as a maximally quoted asset against ENJ, amounting to almost half the total trading volume. Upbit also contributed 19.16 percent of bitcoin-enabled ENJ trades, revealing that many investors were shorting the ‘king cryptocurrency’ to speculate on ENJ.Samsung EffectThe ongoing ENJ rally is reminiscent of a similar upside movement that took place on March 8. The ENJ/USD pair soared as high as 70 percent on that day soon after the Korean media reported a newly forged partnership between Enjin Coin and Samsung. The reports suggested that Samsung’s S10 flagship smartphones would feature an ENJ-enabled blockchain wallet. In a press statement issued after the media reports, Enjin’s VP of marketing, Simon Kertonegoro, confirmed a partnership. However, he refused to reveal the exact nature of their deal with Samsung.Congrats to our partner @enjin for the wallet integration with Samsung Galaxy s10. We are super excited to be part of this mission to bring cryptocurrency/ decentralized token trading to mainstream users https://t.co/AUp1Usrbj8— Kyber Network (@KyberNetwork) March 18, 2019The ENJ/USD rate started correcting lower – as down as 33.5 percent – and found a support area above 0.151. From there, the pair moved horizontally in a right range until today’s rally took over the sentiment.The half-baked downside correction revealed that traders were not simply dumping ENJ at its higher highs. On the contrary, it showed that investors were ready to purchase the crypto asset at new lower-lows and lower-highs’ formations, indicating that the Samsung effect is still in place.A Bullish Sign in Near-termSamsung’s involvement in the Enjin Coin market put ENJ in a fundamentally bullish position. The fact that its bearish correction didn’t pursue an extended move reveals positive trading sentiment among investors. At the same time, with almost 26 percent of traders exchanging BTC for ENJ explains that they want to try out coins with best-placed fundamentals over bitcoin’s potentially bearish action.In technical language, ENJ has just broken out of a bull flag formation – a minor correction that takes place upon forming green candles. The breakout is bullish, purely from the traditional indicators’ point of view. 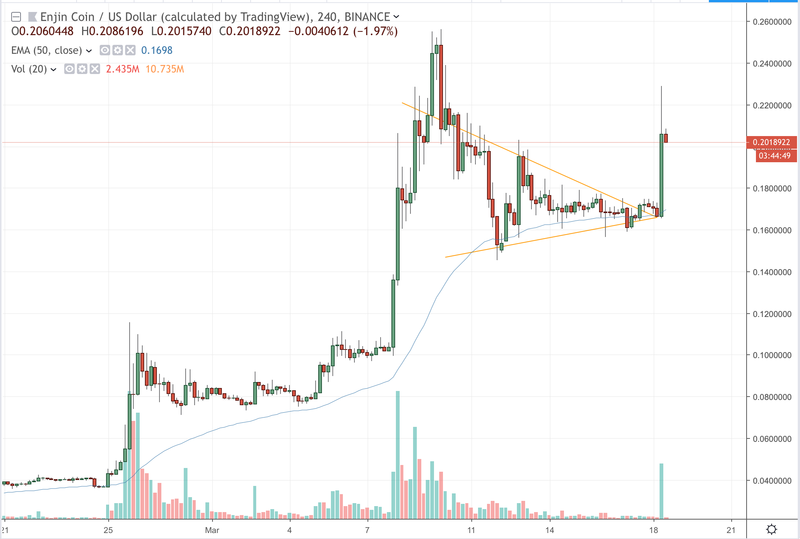 ENJ Bull Flag | Source: BinanceThe coin is now looking at a session support level near $0.160. If it drops below it, then the market could signal an extended bearish correction towards $0.145. To the upside, $0.228 is capping the bullish moves.